The progress of points awards completed (discarding points awards with unlimited earnings). On achievement’s edit screen you will an option named “How progress should be calculated?” that let’s you choose how the achievement progress should be calculated, letting you choose between steps completed and steps progress. Steps completed: Progress will be calculated based on the number of steps completed, for example, if rank has 3 steps and user has completed 2 of this steps then achievement progress will be 2/3. 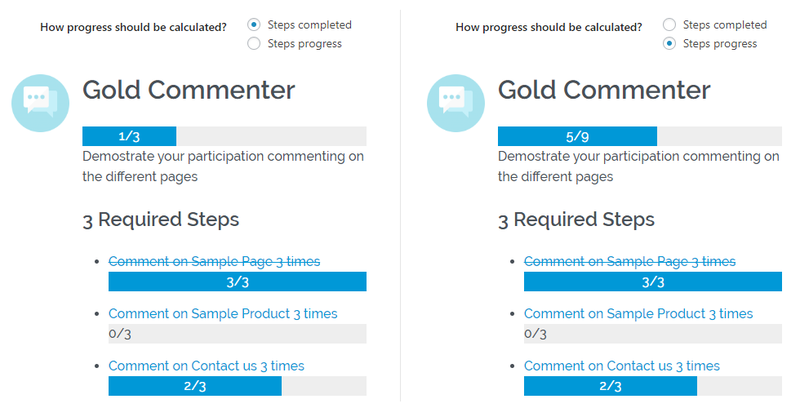 Steps progress: Progress will be calculated based on the steps progress, for example, if rank has 3 steps related to comment on a post 3 times (3*3=9) and user has commented 5 times then achievement progress will be 5/9. The ranks progress is calculated in the same way as achievements, and includes the same options. The progress of all requirements (achievement steps, points type awards and deducts and rank requirements) is calculated based on the requirement required times value. For example, setting a requirement based on the event “Comment on a post” and as required times you set 5, then the progress will be calculated based on the user comments did and this required times (5). 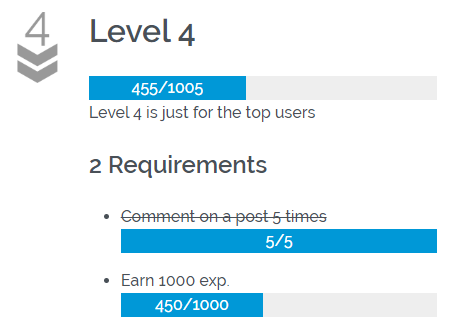 So, if user has commented 3 times, then the progress of this requirement will be 3/5. Some requirements events are related to a specific points amount, the “Earn an amount of points” event is related to the points amount that user has earned and “Expend an amount of points” event is related to the amount expended. On the section above, you can check that an event like “Comment on a post” is based on the required times, for events related with points, the progress will be based on the points required to complete the requirement.